Fifty years ago this month, on Friday 29 September 1967, the BBC Light Programme closed down, in name if not entirely in spirit, to be replaced by Radio 2. Regular listeners to the Light wouldn't have been too disturbed by the changes brought about by that young pop upstart Radio 1. Sure Music While You Work and Housewives' Choice had been dropped but you could still get you fill of Max Jaffa, The Dales and the Frank Chacksfield Orchestra. So how what was offered up on the final day on the Light? Well I've dug out my Radio Times back issue and taken a look. I can't be certain if the Light Programme was still using the Oranges and Lemons theme to gently usher in the day, but if it did it may have sounded a little like this. 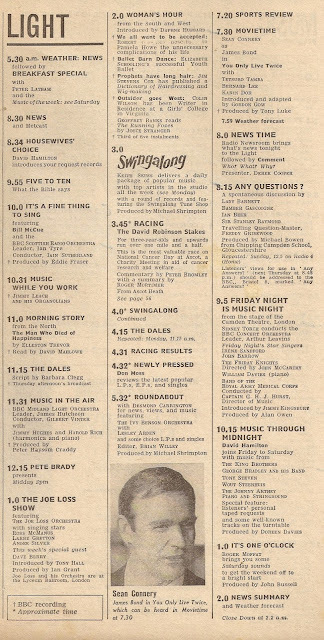 The broadcasting day started at 5.30 a.m. (you'll notice a few programmes starting at half past or a quarter past the hour; drawing up the schedule was a considerably more complex task back then) with Breakfast Special. This was always presented by one of the staff announcers, today the turn of Peter Latham. Whilst there are off-air recordings of Breakfast Special with Paul Hollingdale, Ray Moore and John Dunn I've heard nothing of Peter. So instead here he is reading the news on Radio 1 and Radio 2. David Hamilton once wrote that "my BBC bosses gave me the job of burying the Light Programme". And sure enough he features at either end of the day. "I wondered if the BBC were trying to tell me something". David had been appearing on the Light since The Beat Show in 1963 ("the band with the beat that's reet") but on the final day "I was tucked away in the basement hosting the very last week of Housewives' Choice... Everybody who was anybody had presented that programme, but it looked as though I would be the only one to do so and then be instantly forgotten." No recordings of David on Housewives' Choice exist but we can hear how David sounded in September 1967 thanks to this recording from Friday 8th of Music Through Midnight (more of which below). One BBC radio stalwart that played out for the final time was Music While You Work. Introduced in 1940 "specially for factory workers to listen to as they work" the Corporation had decided it'd run its course. Featuring on that final show was a musician who'd appeared on the first day too, Jimmy Leach. A composer, pianist and organist, just before the war Leach had joined forces with the trio Organola, who a year later would become The Organolists. The group went on to appear in 256 editions of Music While You Work. Remarkably that final edition has survived and comes from the archive of Brian Reynolds. You can download it from this page on his Masters of Melody website. Amongst all the traditional tunes the one nod to pop is Penny Lane. The opening announcer is Brian Hudson and rounding things off is Paul Hollingdale. Orchestral music was still the order of the day, from light music to the more 'poppy' end of the musical scale, with the BBC Scottish Radio Orchestra, the BBC Midland Light Orchestra, the Joe Loss Orchestra and the BBC Concert Orchestra all featuring at different time of the day. The Midland Light Orchestra was one of the BBC's most prolific in-house orchestras, broadcasting every week, sometimes two or three times a week, from 1947 until the late 1960s - it was eventually disbanded in 1973. On 29 September they were part of the Music in the Air programme under the direction of their regular conductor Gilbert Vintner. This is how they sounded in 1963 performing one of their regular morning sequences of music. Some of the former pirate DJs had already come back to dry land before the start of Radio 1 and got a try-out on the Light Programme. That list included Tony Blackburn and Dave Cash plus, and appearing here, Pete Brady with Midday Spin and Keith Skues on Swingalong. The Dales, Roundabout - this week with Desmond Carrington - and News Time would transfer to Radio 2. Newly Pressed would become What's New on Radio 1. There's a rather curious programme at 7.30 pm called Movietime. This was a long-running series, it started in 1961 though there'd been similar programmes before that, which provided adapted film soundtracks for a radio audience. One can only imagine how Gordon Gow managed to cut down the nearly two-hour action-packed You Only Live Twice to a meaningful 30 minutes of radio. 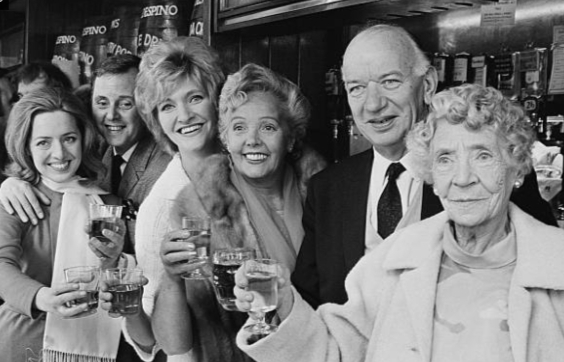 Friday evening sees two programmes that still grace the airwaves five decades on: Any Questions? which would shift over to Radio 4 in 1970 and Friday Night is Music Night, then in its 14th year. The recording of Friday Night is Music Night I can offer nearest to this date is from 25 July 1969. The setting is The Assembly Hall in Worthing. Many of the participants are the same as you'd have heard in September 1967: the BBC Concert Orchestra conducted by Sidney Torch, William Davies at the piano, The Friday Knights directed by John McCarthy and the announcer Jimmy Kingsbury. Diddy David was back in the evening for Music Through Midnight, which would become Late Night Extra on Radios 1 and 2, though, initially at least, without David. By the time midnight arrived it was party time in the rather packed studio. In the nine minutes of off-air audio that survives the DJs who pop in, and most seem to have consumed a fair amount of BBC plonk, include Johnny Moran, Miranda Ward, Duncan Johnson, Tony Blackburn, Chris Denning, Roger Moffat, Bruce Wyndham, Mike Lennox and Bill Crozier plus Cindy Kent of The Settlers. The task of closing the Light Programme after 22 years fell to staff announcer Roger Moffat with It's One O'Clock. In this clip you'll hear an off-air recording of Roger chatting to his old Make Way for Music chum, the singer Sheila Buxton. We then get the final 2 am news bulletin and closedown which the BBC did keep: "There we end broadcasting in the Light Programme, not just for today but, as it seems, forever..."
Later that morning witnessed, in the words of station controller Robin Scott, "the strident birth-pangs of a much-heralded and rather bouncy new radio network - or, rather, the emergence of two new programmes, one resembling in many respects the old Light (but with a number of new features), the other brand new in style (but sharing some of the most popular features of the other)". It was welcome to the world BBC Radio 1 and BBC Radio 2. In the summer of 2015 I wrote about the Light Programme. You can read the first in a series of nine posts here. BBC Radio 2 remembers the days of the Light Programme in the two-part documentary The Story of the Light the first of which airs this evening. The series is produced by Made in Manchester.